Exercise with bone loss is my area of focus as an ACSM certified personal trainer because many of my class participants and clients have osteoporosis or low bone density, commonly called osteopenia. As one of the four volunteer moderators on the National Osteoporosis Foundation’s online Support Community, I comment on questions regarding safer ways to exercise. If you’d like to join the NOF community, click here. You don’t need to become a member to read the posts, but if you’d like to ask a question or start a new discussion, you’ll need to become a member. It’s easy and quick; if you have questions about navigating the NOF site, email me at susie@susiehathaway.com. 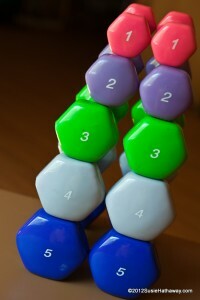 I began a new discussion today entitled, Exercise Questions? Ask Susie Hathaway, as a way to group comments that I’ve posted in many threads. 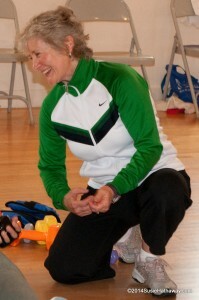 In it, I’ve included links to excellent resources for exercising with osteoporosis. When starting an exercise program, it’s always advised to consult with your healthcare provider. Ask her or him for a referral to a physical therapist (PT) knowledgeable about bone loss. The PT can give one-on-one feedback specific to your needs. Even one appointment can make all the difference in helping you get going safely with an individualized exercise program to help your bones, as well as ensure that you’re moving safely during your daily activities. Also, ask how much weight is safe for you to lift. Done consistently, weight-bearing and muscle-strengthening exercises give your bones a reason to stay strong. Many types of exercise programs have weight-bearing and muscle-strengthening moves, but it’s so important to do those moves with proper form to protect the spine and avoid falls. It can often be a fine line as to what will help your bones and what will hurt them. By the way, all of the exercises in my 2 DVDs, Safe Strength Training for Osteoporosis Prevention and Resistance Band Training for Osteoporosis Prevention, are done with particular care in keeping a neutral spine with no forward bending or twisting to the point of strain. Below are articles and webinars which I often suggest to give you a better idea on what moves to avoid and how to adapt exercises or substitute safer ones. Have a look at them and if you still have a question, ask it in the comments section below. I’ll get back with you as soon as I can, between classes or in the evening. The “Proper Body Alignment” NOF article is a good place to start. The “Moving Safely” section of the NOF website has numerous helpful articles. “Too Fit to Fracture”: A Consensus to Establish Recommendations on Exercise and Physical Activity for Individuals with Osteoporosis, with or without Spine Fractures” Excellent guidelines from Osteoporosis Canada. “Safe Pilates and Yoga for Bone Health” – Even if you don’t do yoga or Pilates, you’ll learn safer ways of moving from this free webinar from the National Osteoporosis Foundation, featuring Sherri Betz, PT, and Matthew Taylor, PT, PhD. “Exercise for Your Bone Health” – Another informative free webinar from the National Osteoporosis Foundation by Karen Kemmis, PT, DPT, MS. 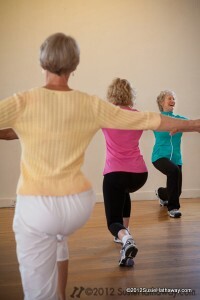 I hope that all of the above information will help you move safely with bone loss. ← NEW! Free Mini-Workout Log for Your Safe Strength Training for Osteoporosis Prevention DVD! You’re terrific Susie! I appreciate all of your work in safer movement exercise for all of us with bone loss. Thanks for your blog and all the information that you provide. Thanks, and you’re welcome, Sandi! Thanks Susie for the good information about posture. We men have some of the same problems with posture as you ladies have, so I’m starting to use some of the suggestions to help improve my own posture. I’ll keep you posted on progress. Susie, I feel like I’m become a bit of a pain but for the life of me can’t see where I can download the exercise logs. That said, I’m loving the weight training DVD and will switch to the bands in a week or so for some variety. Not a problem, Judy! Did you sign up for the newsletter? When you do, you’ll receive an email with attachments of the exercise logs. The sign-up form is in the upper right hand corner of any page on my website. Let me know if that helps, okay? where can I get the resistant bands for the training workouts?